Bret Michaels on the airplane! “When he walked aboard the flight the first thing I saw were the boots, and then the cool jeans and long blond hair. He didn’t wear any makeup and his skin was clear and soft, a beautiful complexion. Then I noticed the bluest eyes I’ve ever seen. We were flying from Orlando to Los Angeles, I think,” said my mother, who is also a flight attendant for the same U.S airline that I work for. “I remember thinking to myself when he walked past me to his first class seat, Oh no, this is going to be a difficult flight. Because of the rock-n-roll connection. I don’t like trouble on my flights,” my mother added rather sternly. “How did you know it was him?” I asked as I plopped down beside her on the sofa in the crashpad. Together we sat side by side watching him, the guy wearing the cool jeans and the long blond hair, on television. “I just knew. Maybe it was the bandanna,” she said. 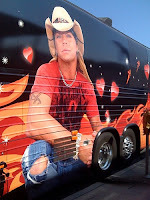 My mother was talking about Bret Michaels, of course, star of the reality TV show Rock of Love Bus on VH1. So what do two flight attendants who are both on reserve at the same time do when they’re waiting for crew schedule to call and send them who-knows-where at a moments notice? They watch TV, and I mean a lot of TV. Me, I like the reality shows. I’m not afraid to admit it. My mom, she likes to watch the weather channel and Fox news. So imagine my surprise when I came home from a horrendous two-day trip, a trip that I’ll be writing about soon, and found my mother – my mother! – sitting on the sofa and watching Rock of Love Bus. To read more go to GALLEY GOSSIP: ROCK OF LOVE – ON THE AIRPLANE! I was surprised to hear you are sitting reserve. Do you have a rotating reserve? How often do you have to sit reserve?I like the reality shows too….I even like American Idol, can’t wait, mostly because my daughter LOVES to dance.Your blog is great!